Our practice focuses on the three main aspects of your Oral Health: Prevention of Disease, Restoration of areas of concern, and Cosmetic enhancement to provide you with the smile you desire. Establishing proper home care is one of the best ways for us to provide our patients with excellent oral health. 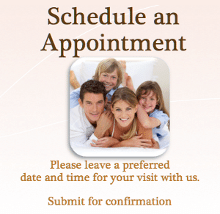 Our licensed dental hygienist will thoroughly clean and polish your teeth. Your personal oral habits and cleaning techniques will be evaluated. Our office is dedicated to getting your oral health into the best shape possible and helping you keep it there. Life can take a toll on your teeth. Over time teeth can become chipped, broken, worn, or even lost. But with the technological advances in dentistry, we can comfortably and conservatively repair and replace your smile to a near-natural and youthful condition. We offer a wide range of cosmetic services from simple whitening to more complex services like veneers or crowns. Modern cosmetic dental procedures make achieving the smile of your dreams easier than ever before. Dental technology is constantly changing and Dr.Dellinger actively seeks out the newest materials and techniques to enhance patient care and comfort. We have invested in state-of-the-art technology in order to serve you better. Our digital radiography is faster than traditional X-rays and exposes you to much less radiation.